OLDEMIRO BALOI, Minister for Foreign Affairs and Cooperation of Mozambique, said his country was preparing for general elections, which would include, for the first time, voting for provincial parliaments. “These elections bear witness to our strong political will and commitment to further strengthen democracy in the country,” he said, adding that, because of such political advances, Mozambique’s economy had become more stable. However, while GDP growth rates had averaged 7.8 per cent over the last five years, the global financial and economic crisis had curtailed the Government’s plan to reduce the poverty rate to 45 per cent, and it had been forecasted that the economic growth rate might slow to 4.3 per cent in 2009. Turning to economic integration, democratic consolidation and political stability, he said countries in Southern Africa had made advances in such areas as free and fair elections, but challenges remained, particularly in areas like peace, security and stability. In Zimbabwe, there had been progress in implementing the Global Political Agreement, which “is enabling the country to move towards an atmosphere of political and social stability, conducive to a permanent dialogue, reconstruction and economic recovery”. 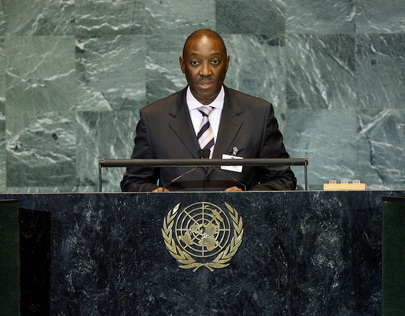 Mozambique reiterated SADC’s call for the removal of all sanctions imposed on that country. It also reiterated its support for political dialogue in Madagascar and urged the parties to implement the Maputo Agreement.